This second volume in the Vanguard series is not written by David Mack, and Dayton Ward and Kevin Dilmore aren't quite as good authors. It's not a night-and-day difference in style or execution but Harbinger Star Trek Vanguard 1 is the better book. * The authors do a good job of showing the difference between how the Klingons react to the Shedai Wanderer and the Federation's response. They have no problems bombarding planets with photon torpedoes but the Federation's attempt to understand what's happening reaps greater rewards in the end. * Why is it that in these shared-world series, it seems authors feel compelled to include every character or race introduced in other books. I noticed this during my Star Wars novel phase - Every book had to include every character from the original films, no matter how much of a stretch required. Here, we get a Romulan ship investigating the Reach. Now, I love the Romulans ("Balance of Terror" is in my top 5 TOS episodes) but there's no reason for their presence here. * There's an ill-considered attempt at humor when Quinn and Pennington are sent to pick up one of Ganz's operatives who has a pet alien named "Sniffy" - do I need to elaborate? * While the attempt to create a truly alien race in the Tholians continues apace, I wish that all their names didn't end in "-ene." It's nearly as bad, of course, with Vulcans or the other races. * Out of nowhere we find that T'Prynn knows Sandesjo is a Klingon spy and, beyond that, we find that Sandesjo is working as a double agent. Huh? When did this happen? And from a narrative point of view, there's absolutely no tension anymore about Sandesjo's role in the Federaton embassy or the threat of discovery. I'm still not particularly interested in any of the characters but the storyline and the writing continue to be good enough that I want to reach closure with the series. 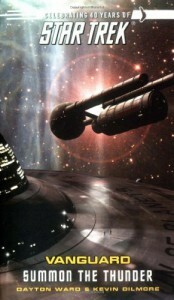 Mack is the author of the third book - Reap the Whirlwind Star Trek Vanguard 3 - and that's in the mail and I have the last two books out from the library so my desires should be fulfilled relatively soon.